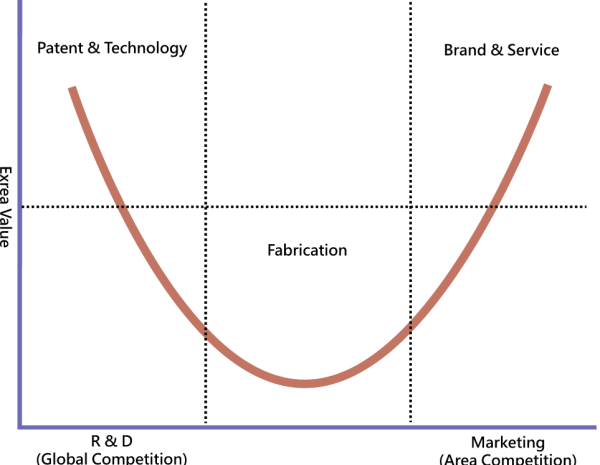 A smiling curve is an illustration of value-adding potentials of different components of the value chain in an IT-related manufacturing industry…According to Shih’s observation, in the personal computer industry, both ends of the value chain command higher values added to the product than the middle part of the value chain. 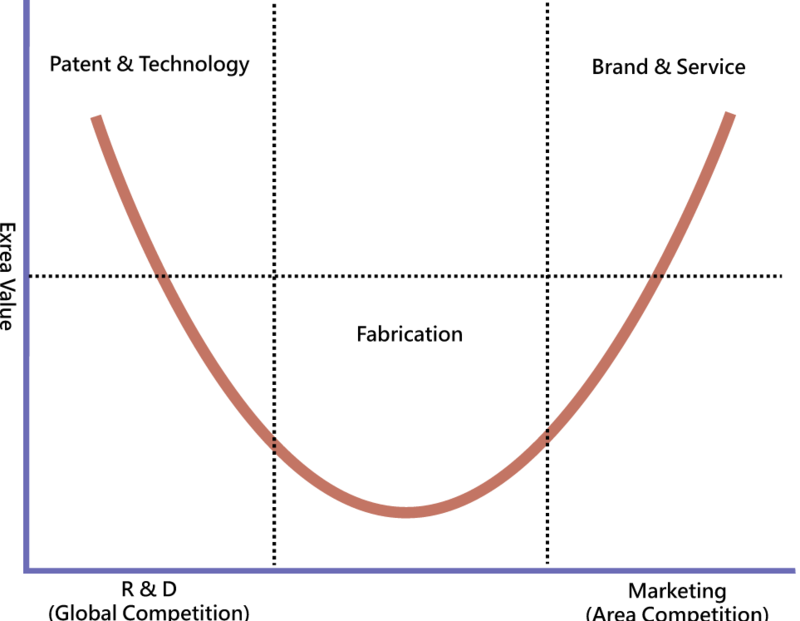 If this phenomenon is presented in a graph with a Y-axis for value-added and an X-axis for value chain (stage of production), the resulting curve appears like a “smile”. What makes this observation particularly ironic is that Acer is the epitomical company at the bottom of the curve. They put PCs together, but it was the critical component makers like Intel and Windows that captured most of the value on the left, and systems integrators and value-added resellers like IBM or Accenture that captured the rest of the value on the right. Acer and its merry band of 8 OEMs1 competed themselves to single digit margins and ultimately stagnant growth; there simply isn’t any money in the undifferentiated middle. Fortunately for Acer, their smartphone efforts have largely failed, so they are being spared the same cycle in mobile: Nokia is gone, Sony is bleeding money, and even mighty Samsung is getting hammered (and is in fact retreating to their component business (members-only)). We all know about how Apple and Google are benefitting, as well as other services like Facebook or WeChat, but life is also good on the left side of the curve, and that is where Largan Precision comes in. True, their $9.6 billion market cap barely registers when compared to Apple’s $623.6 billion number,3 but when you consider that Largan Precision is a relatively tiny company that’s pretty darn impressive, and I can assure you the founders are living much more comfortably than all but the most senior Apple managers. Moreover, it’s not that far off from Foxconn, who actually builds the iPhone; their market cap is only 5x greater than the maker of a single component. There simply isn’t that much money in the middle. For traditional publishers, the home page may soon become akin to the print edition — nice to have, but not the primary attraction. In the last few months, more than half the visitors to The New York Times have come via mobile — the figure increases with each passing month — and that percentage is higher for many other publishers. Enter Facebook’s popular mobile app, which has captured greater amounts of time and, more remarkably, managed to fit a business model onto the small screen by providing extremely relevant advertising…the company has become the No. 1 source of traffic for many digital publishers. Yes, search from Google still creates inbound interest, and Twitter can spark attention, especially among media types, but when it comes to sheer tonnage of eyeballs, nothing rivals Facebook. Here’s the thing: the shoe has in many respects already dropped. When people follow a link on Facebook (or Google or Twitter or even in an email), the page view that results is not generated because the viewer has any particular affinity for the publication that is hosting the link, and it is uncertain at best whether or not their affinity will increase once they’ve read the article. If anything, the reader is likely to ascribe any positive feelings to the author, perhaps taking a peek at their archives or Twitter feed. On the right you have the content aggregators, names everyone is familiar with: Google ($369.7 billion), Facebook ($209.0 billion), Twitter ($26.4 billion), Pinterest (private). They are worth by far the most of anyone in this discussion. One of the great paradoxes for newspapers today is that their financial prospects are inversely correlated to their addressable market. Even as advertising revenues have fallen off a cliff – adjusted for inflation, ad revenues are at the same level as the 1950s – newspapers are able to reach audiences not just in their hometowns but literally all over the world. The problem for publishers, though, is that the free distribution provided by the Internet is not an exclusive. It’s available to every other newspaper as well. Moreover, it’s also available to publishers of any type, even bloggers like myself. In short, publishers (all of them, not just newspapers) don’t really have an exclusive on anything anymore. They are Acer, offering the same PC as the next guy, and watching as the lion’s share of the value goes to the folks who are actually putting the content in front of readers. That Stratechery article, by the way, was about how German publishers were taking Google to court to demand compensation for article snippets that appeared on Google News. Instead Google simply removed the snippets, which resulted in such a drop in traffic that the publishers this week came crawling back asking Google to re-add the snippets, no compensation required. 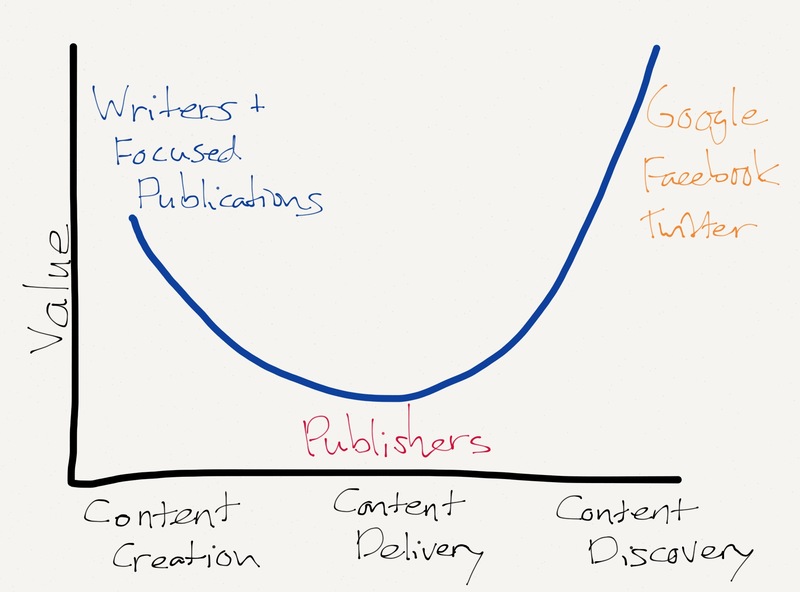 The general takeaway is that Google proved it was adding value to the publishers, but I have a different angle: the publisher’s demonstrated that they provide no value to their writers. See, Largan Precision doesn’t really care if their camera phone modules end up in iPhones or Galaxys or Lumias, or if they’re physically integrated by Foxconn or Quanta or Compal. They survive – and survive quite profitably – based solely on their ability to manufacture the best miniature cameras in the world. 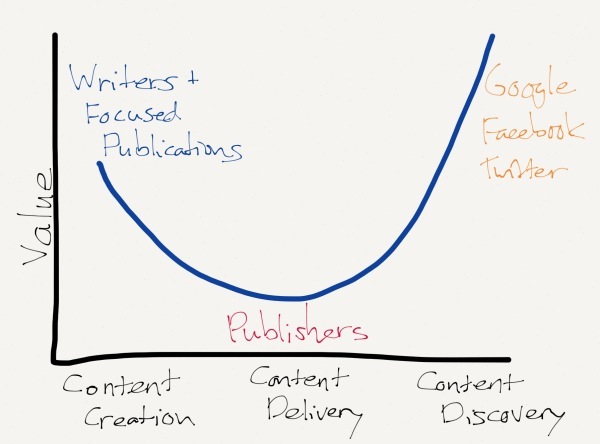 I remain convinced that the most successful writers and publications will pursue a similar strategy: do what they do best and accrue outsized value relative to publishers that are rapidly shifting from platform to obstacle. This trend isn’t limited to publishing, either. Last week HBO announced that it was finally going direct to customers; while I think declarations that this decision will lead to cord-cutting are massively overstated, it is certainly a devaluing of the cable middle person. You can also view AT&T’s decision to lock the Apple SIM to their network in a similar light: they are trying to stave off their inevitable future as a dumb pipe between valuable content and valuable devices. Apple Pay will, in the long run, have a similar effect on banks (which is one reason it’s so fascinating to see banks embrace it while some merchants – who will benefit from more and faster transaction – be opposed). All of this is because of the Internet: by removing friction it removes the need for folks in the middle, and the result is that value will flow to the edges. In the case of publishing that is aggregators on one side, and focused, responsive, and differentiated5 writers and publications on the other.